Driving on the left side of the road to get more common in Northern Va.
Northern Virginia leaders celebrated driving on what is usually the wrong side of the road Tuesday morning at the ceremonial opening the first of several expected diverging diamond interchanges. 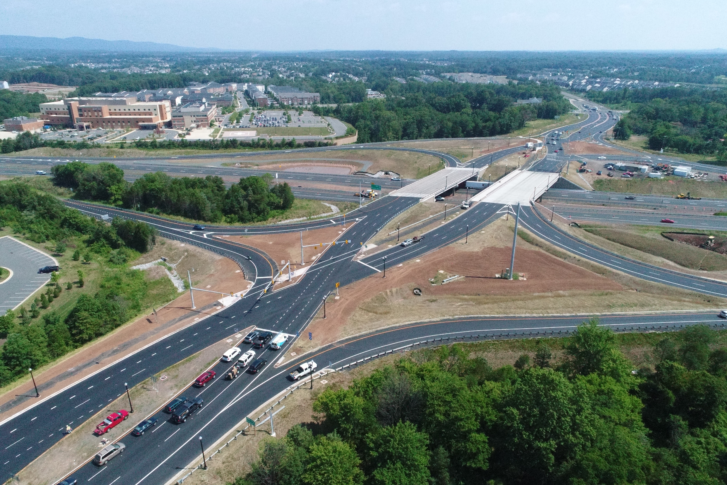 HAYMARKET, Va. — Northern Virginia leaders celebrated driving on what is usually the wrong side of the road Tuesday morning at the ceremonial opening the first of several expected diverging diamond interchanges. The ribbon cutting at U.S. 15 and Interstate 66 celebrated the new interchange that first partially opened this winter, and fully opened in the last few weeks. It sends traffic on Route 15 across to the left side of the road above I-66 before moving traffic back to the right side on the other side of the highway. The design is meant to cut down on crashes by eliminating left turns across oncoming traffic, while also cutting down on the amount of time traffic is stopped at red lights, said Bill Cutler, Northern Virginia District engineer for the Virginia Department of Transportation. The $59 million project also included widening and other upgrades for U.S. 15 and a shared-use bicycle and pedestrian path. Construction is moving forward for a similar design for Courthouse Road at Interstate 95 in Stafford County; there are plans to put one in at spots such as Nutley Street over Interstate 66 in Fairfax County as part of the new I-66 toll lanes, and Prince William County is hoping to put one in as part of a widening project for Balls Ford Road near Route 234 Business.